If you're going to eat something that's been ground, mashed together, seasoned, cooked and dressed up with all types of things that change how it tastes, you'd certainly better be sure what you're eating is the absolute best. 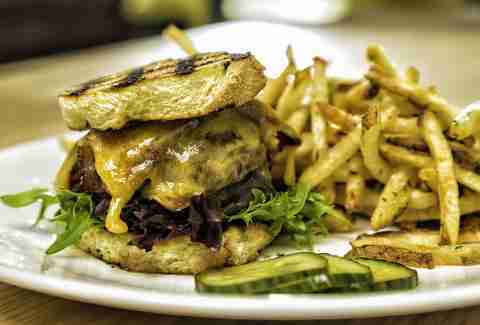 Quietly, ATL has become something of a burger-crazed town. And with so many restaurants serving great ones, it’s only right that this list is somewhat extensive. 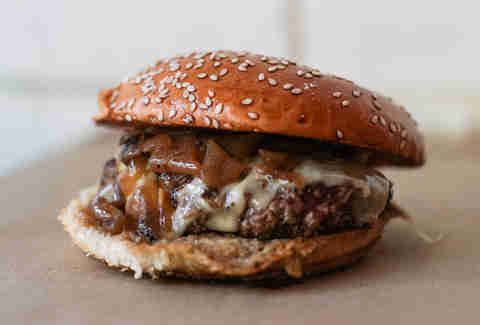 That way, if you like hitting places where you can get certain types of burgers (steak burgers! Pork burgers! Chicken burgers! Duck burgers!? ), there's a best-in-category spot just for you. And let's not pretend that burgers are something you should be eating on a daily basis, our national burger critic notwithstanding. So what's a patty lovin' ATLien to do when there are almost too many choices? 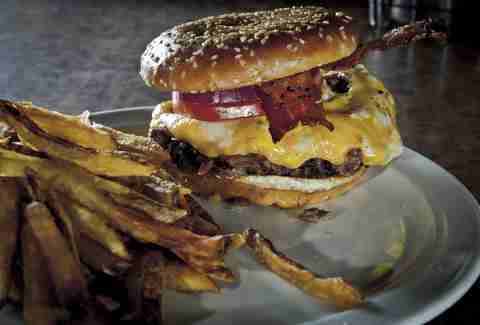 Peep this roundup of Atlanta's best burgers of course. 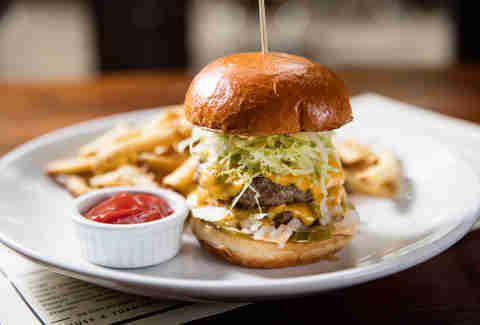 Chef Todd Ginsberg created the burger stack at Bocado. 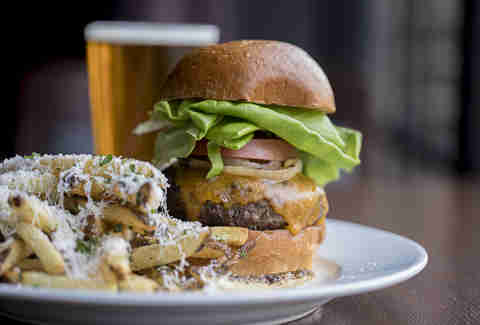 He left in 2012 and opened The General Muir, where he created an updated version. 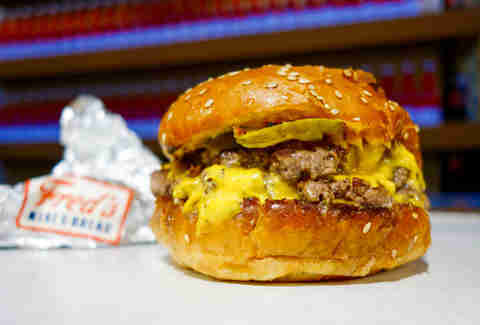 Now at Fred’s, one of Ginsberg’s Krog Street Market stands, you can get a faster (but still delicious) double-pattied burger of crispy seared ground beef on bread from his TGM Bread company -- in four to seven minutes -- simply accented with American cheese, mayo, and bread & butter pickles. The fact that you’re eating a burger in a place that brews its own beer is alluring enough, but let’s talk about the signature burger. It’s made using grass-fed beef from Southeast Family Farms (a network of generational GA farmers organized by beef purveyor Halperns’), whose juiciness and flavor mix perfectly with shreds of iceberg lettuce, vine-ripe tomatoes, fontal cheese, mustard, and dill pickle. If this sounds perfect as is, wait until they add the bacon slices. We love the Cowboy Style, but the truth is that the Apache Style is Grindhouse's current champ, in the sense of getting a low cost burger that makes your buck bang. The Apache comes with pepper jack cheese, grilled onions, New Mexico green chiles and lettuce, and you can get it double-pattied for $8.99… or keep it at a junior (which is enough) for a mere $6.99. The way the white Cheddar cheese lays between the shiny French bun and a single 6-ounce patty of Aberdeen Angus beef that’s grilled on a Big Green Egg reminds you of the security blanket you grew up clinging to for happiness in your youth. Then you feel the burn of the poblano pepper underneath the beef, which is coolly balanced by a layer of cilantro aioli. And you realize you’re a grown-up, and even happier with life than you were as a kid. This is the burger of adulthood. 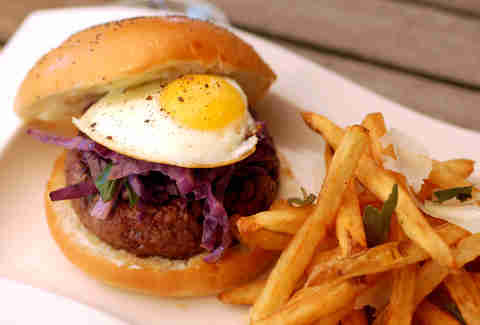 The flavor of this surreptitious lunch-only burger will surely arouse your taste buds. The bun is from Alon’s, the two patties are made of 80% pastured Oregon beef and 20% Iowa farmed bacon, and… well, do you really need more detail? Ok, how about this: the menu doesn’t even tell you what it is. because it's not even on the menu. You have to order it by name and it'll set you back $17. Worth it. 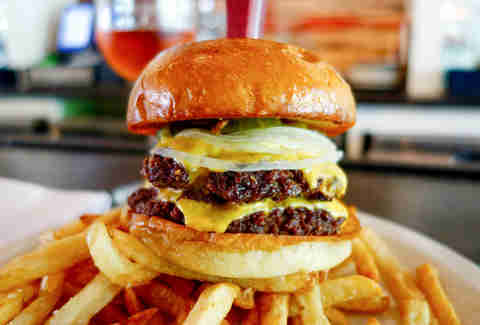 The Westside’s best burger is something you need to experience. 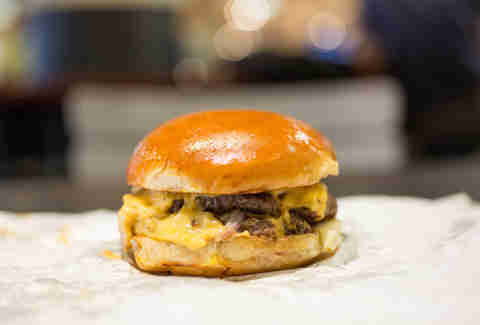 House-made mayo and American cheese set the stage; two 3-ounce patties of brisket, chuck, and short rib are the stars; and a soft buttery bun with a pile of pickles are the encore. It was only a matter of time before Linton Hopkins realized the burger served at Holeman & Finch was big enough to be a solo act. (It was previously only served at the bar.) 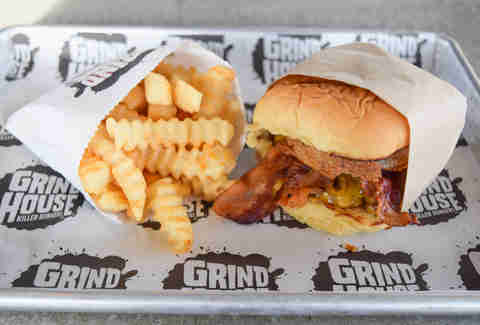 Now, with its own PCM burger stand, ATL’s most famous griddled double cheeseburger -- which in some ways inspired almost everything that came after it, like Nas’ first album -- is much easier to stuff your face with. They get it out to you in under 10 minutes, and it’s still high quality, with the perfectly sized, butter toasted H&F Bread Co. buns, house-made ketchup, mustard, and pickles. It’s definitely still the champ. 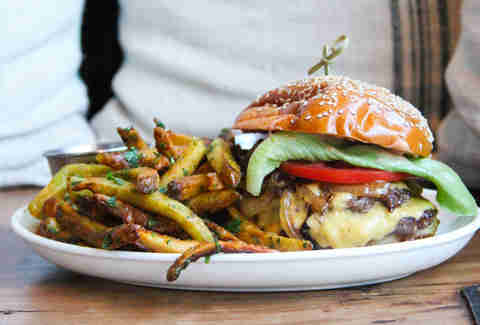 If you were going to eat a $29 burger, this is it. Atlas's BLT, with freshly ground wagyu beef on brioche with bacon, house ketchup and mayo, a house-made dill pickle, heirloom tomato, pimento cheese, and incredibly crispy fries as a side is a meal worthy of lightening your wallet. Seriously, the fries alone taste like $20. But not literally, of course. 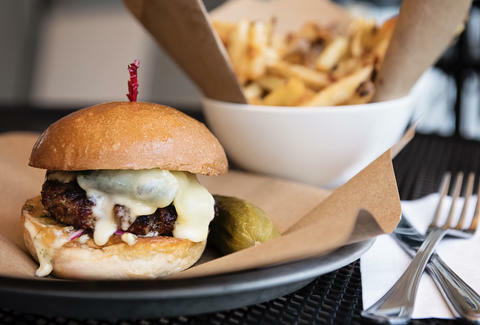 If you haven't made it to Ludacris' ATL airport restaurant and gotten acquainted with the menu Chef Todd Richards helped craft, their beer-cheese burger is a good place to start. Made with a mix of ground beef chuck and short ribs, it's topped with caramelized onions, crisp smoked bacon, bread and butter pickles, and a house-specialty cheese sauce, hopped up with Sweetwater Hash Session IPA. You'll go back for the first time. The 7-ounce salt-and-pepper-seasoned patty is cooked on a hot cast-iron skillet, then finished in the oven before it’s transferred to a grilled chili cornmeal bun laid with bacon and Tillamook Cheddar. Oh, they have really great drinks too, which are also probably somehow made with cast iron. Don’t quote me on that. A burger consumed in one of ATL's most elegant outdoor eating areas, right on the banks of the Chattahoochee River, can't be complete without something special. In Canoe's case, it brings the water and land together by giving you a beef-duck burger blend that's topped with a sunny-side egg, spinach, and pickled onions. 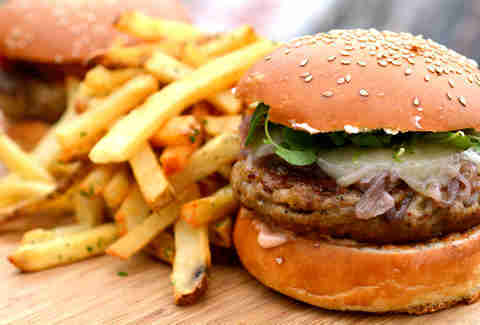 They also serve it alongside truffle pommes frites. A lot of what I’ll call “burger farms” started popping up in ATL a few years ago, but few have survived and thrived like Farm Burger. They’ve got a few delicious variations, but the No. 1 is a strong standard, with its aged Vermont white Cheddar, caramelized onions, and house sauce, which are all great as a group but are greater when you add local bacon for 2 bucks. If you need a second option, try the No. 3 made with pasture-raised pork. You can't simply forget that Barleygarden, being a beer garden and all, also enlists Chef Kevin Outz of The Spotted Trotter charcuterie and butcher shop. His burger contribution is an 8-ounce mashup of flavor that seems specifically designed to bridge cultural taste gaps, with grilled pork bratwurst, Russian dressing, caramelized onions, and Swiss cheese on a sesame bun. Also remember they have 61 taps flowing, and being that it's the Hop City gang choosing the brews, you should have a global awakening before your food coma. South Africa does things a bit differently when it comes to, well, life. One thing specifically they do better is grilling, which they call "braai" and is more about true open-flame cooking. Cape Dutch's burger follows this tradition with a braai-prepared 8-ounce Angus patty, topped with house-made peri-peri sauce, pickled green tomato, applewood bacon, caramelized onions, and mild Cheddar cheese on a toasted brioche bun. The Local Three/Muss & Turner's gang is known for pulling off highbrow and lowbrow dining experiences at the same time. The McDowell is a nod to the famous Mickey D's knockoff from Coming to America, and in this burger, L3 makes their rendition of a Big Mac. There's no ridiculous three-floors of bread, but they do have two quarter-pound beef patties with a special sauce, American cheese, pickles, onions, and even iceberg lettuce. Of course, this version is approximately 10,000 times better since their ingredients are super fresh and the beef is Angus, but you'll still want to crack a burger-in-cheek joke about "the golden arcs" after your first and final bites. Take a break from beef like your doctor's been begging you to and go white meat with H+H's blended chicken burger -- of which one-quarter of the patty is ground shiitake mushrooms. 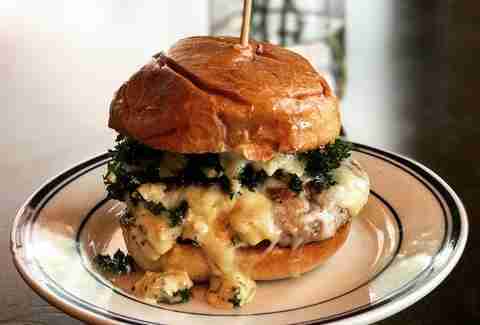 The fried kale, Swiss cheese, and rosemary/caramelized shallot aioli all come together to create a healthier Voltron of poultry burger perfection. Elevating burgers to fit their steakhouse style, Oak hits you with a blended patty of Certified Angus NY strip, filet mignon, and short rib. 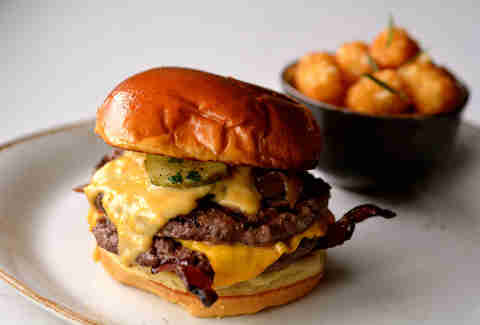 They then layer it with grilled Vidalia onions, tomato, bibb lettuce, sharp cheddar, and pickles. 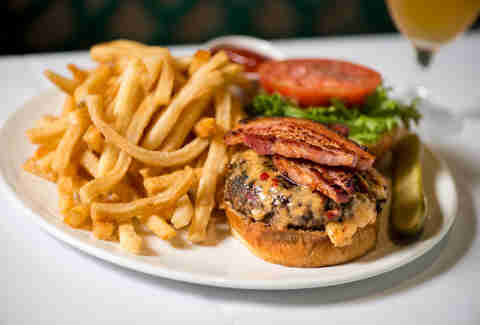 It's served on brioche with truffle fries, and you can pay $3 extra to add bacon. 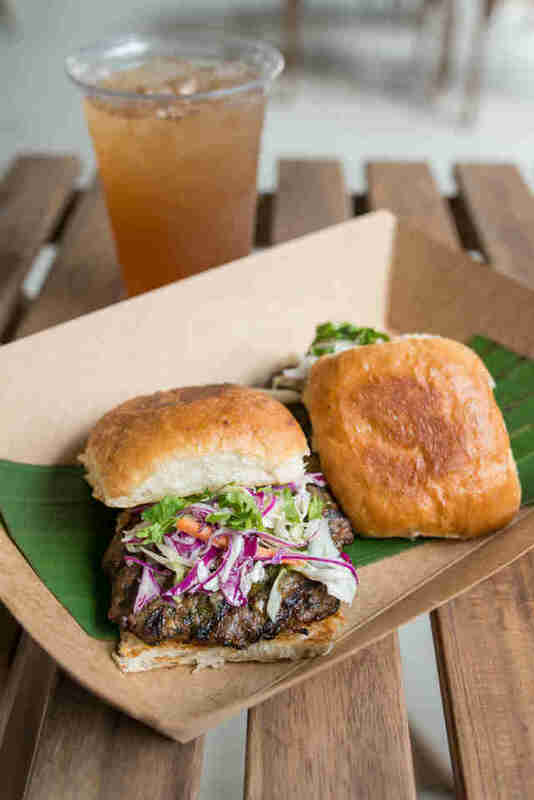 PCM's Indian food pit stop offers two incredibly flavorful ground lamb sliders seasoned with cumin, ginger, chilies, mint, and cilantro, served on toasted, ghee-brushed buns with desi slaw, green chutney, and Maggi ketchup. You almost don't even have to eat the thing to realize you've probably been doing burgers in a, well, not so slightly less creative way. It’s technically what the name suggests, although it’s also so much more. See, Fox Bros. already had a brisket sandwich, but they figured they’d flip the format by offering a “burger” that’s actually made of chopped brisket (thus the quotation marks). Then they added bacon, tomato, red onion, pickles, melted pimento cheese and jalapeño mayo. You’ll probably start putting everything you say in air quotes after you eat it, in hopes that such grammar tricks will magically reveal that everything is possibly made of brisket. Mike Jordan almost died reviewing burgers with Kevin Alexander during his Best Burgers in America death wish, so don’t even play like he doesn’t live this burger life. Hit him on the 'Gram or Twitter if you want to discuss fries though.